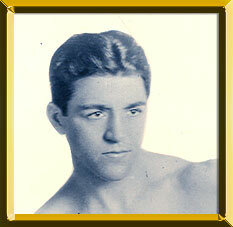 SAMMY MANDELL, whose real name was Samuel Mandella, fought during one of the lightweight division's golden eras. The 5'6" Mandell, who hailed from Rockford, Ill., emerged as one of the top lightweights in the post-Benny Leonard era of the late-1920s. The tough slugger, who turned pro in 1920, averaged between 15-20 bouts a year during most of his career. Although certainly noteworthy by today's standards, Mandell's activity was not uncommon in his day. Mandell lost only five bouts en route to his title shot against lightweight king, Rocky Kansas. On July 3, 1926, he won a decision over the champion over 10 rounds in Chicago. Although he didn't put the title on the line for two years, Mandell did fight the top 135-pounders in non-title affairs. He decisioned world ranked Phil McGraw and Billy Petrolle in a pair of 10-rounders, and drew with Jackie Fields over 12 frames. His two successful title defenses came against Hall of Famers. On May 21, 1928, he completely outclassed future welterweight great Jimmy McLarnin in New York, and 14 months later outpointed eventual lightweight and junior welterweight king Tony Canzoneri over 10 rounds in Los Angeles. By 1929, Mandell's pace and rough style started to take their toll as he dropped two 10-round decisions to McLarnin. Nevertheless, Mandell, and the rest of the boxing world was shocked when he lost his title via kayo in just 1:46 of the first round to power-punching Al Singer, July 17, 1930. Although no longer a world contender, he fought until 1934, with his only noteworthy triumph coming against future Hall of Famer, Battling Nelson.